The recently released Wirify Pro with OmniGraffle export has had a positive response so far and we wanted to thank everyone for your support! Based on the feedback some of you – especially those on a PC – have found the export format somewhat limiting though, as OmniGraffle is only available on the Mac. Image placeholders, interactive elements and input elements are shown using native Balsamiq controls for that “sketchy” look, and therefore the exported wireframe looks slightly different to your Wirify wireframe in the browser. Element locations and dimensions are still the same. Balsamiq Mockups does not allow naming many of the native controls and therefore each page element is exported as a group. The name of the group is the same as the original source element (HTML tag) on the page. Balsamiq Mockups does not support background image tiling and the paragraph graphic can appear vertically stretched depending on the size of the page element. If you have suggestions on how to address this please post in the comments – thanks! Balsamiq Mockups doesn’t have a similar concept of “layers” as other diagramming tools like OmniGraffle, Adobe Illustrator and Microsoft Visio. All page elements are part of the same single mockup in the exported document. Balsamiq Mockups has a page height limitation of around 4,000 pixels. Wirify Pro will not let you export pages longer than this, as they are not easily editable. Balsamiq Mockups can take a while to load more complex wireframes with lots of page elements. 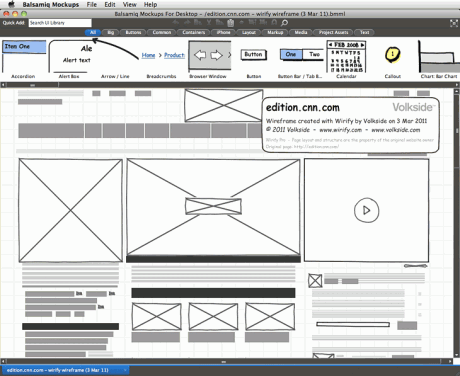 Balsamiq Mockups export is available right now to Wirify Pro customers. This is the very first release of the Balsamiq Mockups export functionality and it may change and improve based on your feedback. The trial offer is now closed, thank you for your interest! Some of you have voiced your opinions on the Wirify Pro pricing and after consideration we’ve decided to revise it. The pricing is still usage-based but the unit prices have been significantly reduced. These prices represent a saving of 22%, 25%, 29% and 33% respectively, compared to the same bracket in the previous pricing. We hope this makes Wirify Pro more accessible to everyone. In light of the above changes customers who have recently purchased Wirify credits will receive a number of additional credits proportionate to their latest order. Please take our customer survey and help us make Wirify a better product! The survey only takes 5-10 minutes to complete and all questions are optional. Posted on 07/03/2011 in Announcement, Interaction design, Product update, Prototyping, Wireframing Both comments and pings are currently closed. We’ve updated the post to clarify that if you’re interested in the Wirify Pro trial offer you should email us first and complete the survey only after you’ve tried the product. Please contact us if you have any questions. Apologies for the confusion.